Holocaust Memorial Day is an annual reminder of the six million Jews murdered during World War Two and the millions of people killed in Nazi persecution and subsequent genocides. This week I accompanied British author Derek Niemann to a meeting in London, where he talked to a Jewish audience about his grandfather, an SS officer in the concentration camps. It came as the most profound shock to Derek, who writes gentle books about nature, to discover a family secret which had been hidden from him for more than 50 years. He accompanied his wife Sarah to a conference in Berlin and decided to try to visit the house where his father had grown up during the war, in order to take some photos. He looked up the address online. “Up came a sheet which said SS-Hauptsturmführer Karl Niemann… crimes against humanity… use of slave labour,” recounted Derek. This was the moment which took Derek’s life on a complete turn. “I’m a nature writer. I write about bees and butterflies. I don’t write about Nazis,” he said. It was all about to change. Years of research, delving through archives, visits to Germany and difficult conversations with family members, produced the complex story of an ordinary man, captured vividly in Derek’s book A Nazi in the Family. Derek’s grandfather led a double life of family man and organiser of slave labour in the concentration camps. A pen-pusher, is how Derek’s father Rudi described him – but it turned out that he rose to the equivalent rank of an SS captain and organised slave labour in the concentration camps on a colossal scale. Derek and Sarah were aided in their quest by one of Karl’s hobbies – he was a keen photographer. They discovered a treasure trove of about 500 old negatives which had been left in the house in Berlin which he abandoned in haste towards the end of the war. Incredibly the negatives had been saved by the Jewish family who were given the house in war reparations. They reveal the intimate minutiae of a loving SS family, and a man who led a contradictory double life. He travelled to all the concentration camps, doing the financial books and running an SS commercial enterprise producing furniture and war supplies – all made by slave labour. But in the evening he came home, tended the garden and helped raise four children. His oldest son, Dieter, was killed in the closing days of the war, fighting with the Panzer tank division. Skeletal men in striped uniforms even visited his house to do odd jobs. His wife Minna gave them food, although she’d been told not to do so. Karl’s bookwork even seemed to lament the financial challenges of running a business which kept killing its workers and the unfortunate need to order coffins for them. “He was a bit of a failed mediocrity, my grandfather,” said Derek, “He’d been sacked from his job. He felt disappointed in life. And I think the prospect of wearing this glamorous uniform, of being a somebody appealed to him. This week, Derek gave a talk about his grandfather to a Jewish audience in north-west London. He was invited there by the Jewish service organisation B’nai B’rith. The BBC has been asked not to reveal the location. He told his audience, many of whom were descendants of concentration camp victims, about one particularly shocking childhood memory his father recounted, even though he was suffering from dementia. “He could remember the family staying in the SS barracks [at Dachau concentration camp] and his parents were at the window looking out at a low building with smoke rising from a chimney. During his research, Derek questioned Holocaust historians closely about his grandfather’s refusal to admit knowledge of mass murder. Derek was asked by a member of the audience if the denazification process after the end of the war was effective? Derek told them he didn’t think it had any effect at all. “My grandfather, in common with other SS officers, went through a very intensive brainwashing exercise. If you look at about 300 Nazi criminals who were in Landsberg Prison awaiting the death sentence, not one of them – not one – showed contrition for what they had done. 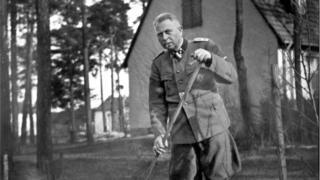 Karl was interned in prison camps for about three years after the end of the war, and was sent to the denazification commission and charged with war crimes and crimes against humanity. But he was lucky to be found guilty of being only the lowest grade of offender – that of a Nazi follower – largely because the most incriminating evidence against him had been sent to the War Crimes Trials in Nuremberg to convict his immediate boss, who was executed. After the war Karl Niemann was charged with war crimes. He was found guilty of the lowest grade of offender, that of a Nazi follower. The Jewish audience were visibly moved by what they heard. “I think it is very shocking to hear that none of them showed contrition,” said one woman. Another audience member, Noemie Lopian, translated a book her father wrote called The Long Night about his four years in concentration camps. Hear Andrew Bomford’s full report on Radio 4’s Broadcasting House programme on Sunday 28 January at 09:00 GMT and then on iPlayer afterwards.